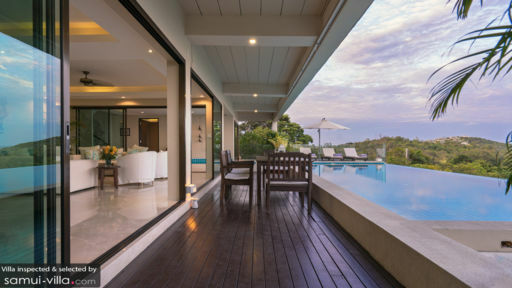 Set upon the hillside of North Chaweng, Villa Sukham sits in the exclusive, gated property of Narayan Heights estate. The villa’s prime location provides vacation makers puts vacation makers close to the lively attractions of Chaweng, while offering a tranquil and restful setting. A quick five minutes’ drive brings guests to the picturesque shores of Choeng Mon. A total of six bedrooms offers ample space for accommodating large groups. All bedrooms are furnished with king-sized beds, TVs, dressing areas, en suite bathrooms and rain showers. Beautiful touches, like wood fixtures, silky drapes and creamy colours help create a serene environment perfect for rest and relaxation. Make a splash in the sparkling rim flow pool, or soak up the sun while you lay back against the comfy sunbeds. An outdoor dining table serves as the perfect spot for alfresco meals; dining experiences at this spot comes with ocean views and plenty of sea breeze. Need some drinks while you take a dip? Swim up to the wet bar, and you’ll be served glasses of your favourite cocktails. The lush and contemporary living spaces of Villa Sukham exudes vibes of modern chic. The light, neutral hues contrasts well against the darkwood pieces, and a choice selection of cushions and indoor plants adds pops of colours indoors. If you’re in the mood for relaxing indoors, you’ll have a plush home theatre and well-equipped entertainment room to take your pick from. Villa Sukham is a full-service property manned by four on-site staff. Housekeeping services, security services, personal guest services and a daily breakfast service are included with your stay. Airport transfers and personal chef services are available at additional cost. The villa offers family-friendly amenities. A baby cot is available for use free of charge, while professional child minders may be engaged at additional cost. 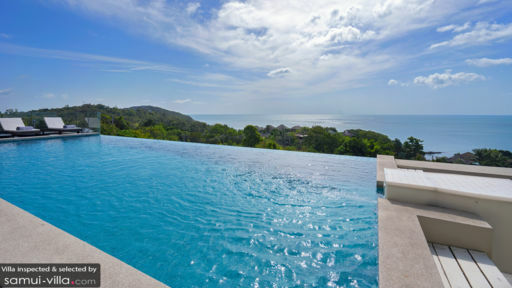 Villa Sukham is located in Chaweng, North Samui. The vibes here are energetic and lively; as the busiest and biggest town on the island, Chaweng boasts a vibrant and varied dining and nightlife scene. It’s also known for its postcard-perfect beach, where you’ll find a powdery white sand coast and sparkling waters. Chaweng Beach may be the hotspot in town, but there are other options if you’re looking to escape the crowds. Chaweng Noi Beach, an extension of Chaweng Beach offers a completely different atmosphere; it’s far quieter, making it a more popular option among family vacationers. There’s also Coral Cove Beach; located about 20 minutes’ drive from your villa, the beach offers a peaceful setting and excellent snorkeling. Beyond the beach, Chaweng offers cultural attractions, viewpoints, yoga, spas and more. Visit Lad Koh Viewpoint for incredible sunrise vistas and uninterrupted views over Chaweng. Unwind at the Four Seasons Resort Spa (there’s a dedicated kids spa too) or The Sarann Spa, or stretch it out on a yoga mat at the breezy, open-air studios at The Yogarden Samui. Island Organics’ Thai cooking classes are a great option for foodies with a keen interest in organic fare and eco gardening. Choose from a wide-ranging array of dining venues, which range from rooftop restaurants to steakhouses and beachside venues. We like Dr Frogs Bar & Grill for its inviting ambience and live music, while Zama Rooftop Kitchen/Bar is a great option for sundowners. From your villa, you’re just 16 minutes’ drive to Fisherman’s Village in Bophut, a hub with myriad shopping and dining options. Stunning house with an incredible view and a spectacular swimming pool. A light wind can withstand the heat. The staff is perfect, discreet and efficient. The kindness of Tai is very appreciable and Nat is there to help us in the reservations and the advice of every day: it is perfect. The rooms are all identical with shower, dressing room and king-size bed. We had a wonderful stay.